Definitely a mixed bag of results this morning for the Blatters. I will not wildcard. I will not wildcard. Oh well, started late (today). Look out for my auto-fill enabled MetaMucilnauts! 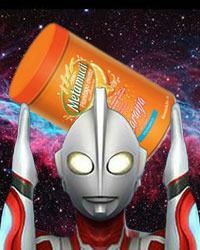 [FnG] metamucilnaut wrote: Look out for my auto-fill enabled MetaMucilnauts! Well, swat my 'hind with a melon rind — if'n it ain't [FnG] Metamucilnaut from Georgia! This is quite a big surprise; welcome back to Fundesliga, ya old bastich! Two things: 1.) Your team has some fairly shrewd picks in it for "autocomplete." Apparently, for you, autocomplete pours over Gameweek One's stats and results, eh? Pretty dangerous looking squad, actually. Whispers: Not sure J. Cole is actually nailed on to start with Downing there at West Ham now. Don't know if you saw, but NBC now has the rights to broadcast the Premier League in the U.S.
Oof, what a strange season it's been. All over now — Man Citeh takes the Premier League title. Well, after EIGHT YEARS of struggling, yer ole Kril finally wins his first Fundesliga title. Yay! Things didn't go so well in the head-to-head league — after finishing first on the table (I know, right? ), I got run over by Middlelmaat Vooruit in the first round of the playoffs. Nihilist got WAXED by Wilborough Wonderers (da Baron), leaving Wonderers and Vooruit to duke it out for the championship. 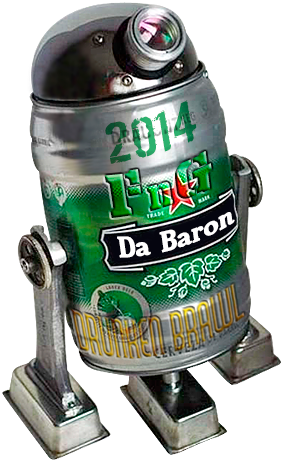 Vooruit failed to bring his 'A' game and da Baron carries off the Drunken Brawl trophy. HUGE CONGRATS TO DA BARON!! Final table below, along with the presentation of the trophies. A BIG THANK YOU to everyone who played, and we hope to see you again next season. 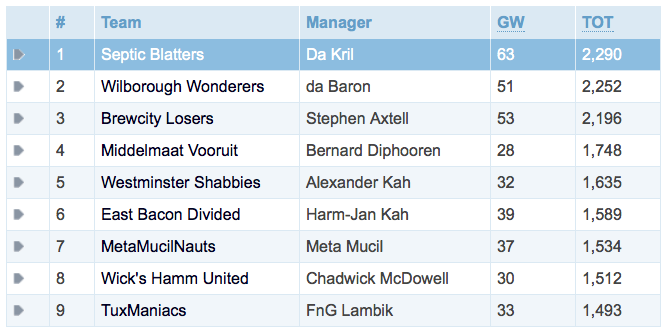 Any interest in keeping the Fantasy Footy league going? Post here to let us know, as the Premier League 2014-15 site is up and running. Every time I start out with enthusiasm and every time I fail to keep updating the team after a short while. The Fundesliga is back up and running! It can't be stopped. Come join the 2014-15 fight for supremacy. Go here and set up your team (FREE). I'm in the unlikely position of defending my crown. Can I do it? Will I be slapped down the table in the first few weeks? Surely there are a few more Footy experts who want some glory and a slice of the DENY Kril his title defense pie?